It's that time of the year again and the last major in Dota 2 this year is approaching fast, the final of the DreamLeague Season 8, which will take place at the DreamHack Winter 2017. This tournament is eagerly awaited, as the last patch has changed a lot in Dota 2. The teams had enough time to find their way into the new patch and will probably be in top form on the DreamLeague Season 8. A total of 8 teams will participate and the special thing is that there were no direct invitations. Each team had to play their way into the tournament via region-specific qualification rounds. This ensures that every team deserves its place in the DreamLeague. The prize money of a total of $1,000,000 is also quite respectable and the winner will take home a proud $500,000. This event is classified as a Major according to the new Valve Esport Plan, which means that the teams can earn points to secure direct invitations to TI8. There will be 1500 such points. The DreamLeague Season 8 will start directly with the playoffs and so tension is guaranteed from the first to the last minute. In a big tournament like the DreamLeague Season 8, it's not surprising that the first bets are already available. As already known in Esports betting, there are the three big bets that we will introduce below. The DreamLeague Season 8 will start directly into the playoffs, as the group stage has already taken place in the qualification rounds. So we can look forward to some very exciting games where things will get tough right from the start. The tournament will be played in Double Elimination mode, which means that teams will be able to slip into Loser's Bracket after a defeat and continue to play for their tournament stay. Many high-calibre Dota 2 games await us from which the overall winner will be found in a best-of-five at the end of the Grand Final. 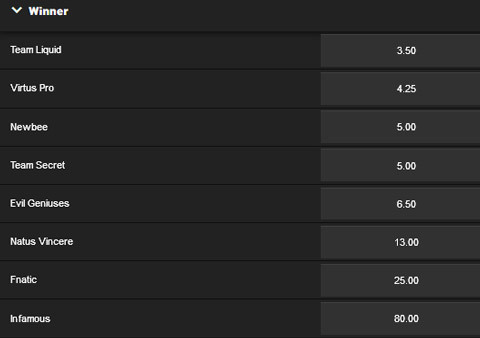 Already in the run-up to the tournament, the big Esport betting providers for Dota 2 published their betting odds for the DreamLeague Season 8, a big and important tournament that will surely be watched by a lot of fans and now there is the possibility to increase the thrill with Dota 2 bets. First and foremost, there are the three classic bets: overall winner – bet, which teams reach the final and the region of the winner – bet. There is a good chance that special bets will be added at the beginning of the tournament. Of course, you can read some interesting facts in the bets. Team Liquid is the favourite of almost every bookmaker and this comes as no surprise, since their TI7 victory they are among the strongest teams in Dota 2, but Virtus.pro, who won the last major, are also credited with a lot of chances. The exciting thing is, if Virtus. pro can actually win this major too, then their invitation to TI8 is almost certain, as they would have by far the most qualification points. Attention: betting odds may change at any time until the official end of betting! Fnatic: EternaLEnVy, Abed, Ohaiyo, DJ, pieliedie. Evil Geniuses: Arteezy, Suma1L, UNiVeRsE, Cr1t-, Fear. Infamous: Kotarō Hayama, Papita, StingeR, Scofield, Accel.